Sheet jointing of 98% pure exfoliated graphite reinforced with a central layer of 0.1mm thick tanged stainless steel. The graphite is compressed onto the perforated metal sheet to give a secure mechanical lock without adhesive. • Exceptional resistance to blow-out and crushing. • Extra strength for ease of handling and fitting. BAM approved for use with liquid and gaseous oxygen in flange connections of copper, copper alloys or steel at operating conditions up to 130bar and 200°C. guidelines, for steam, air and other oxidising media. For applications falling into the green zone, the product may normally be used without consultation. In the amber zone we recommend that our technical services team be contacted for confirmation of suitability. If the pressure/temperature combination is in the red zone then we must be consulted before the product is used. Class lines refer to ASME B16.5. 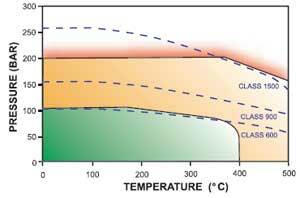 For inert/reducing media the maximum temperature is 700°C, but ensure that temperatures above 400°C on atmosphere side of flange do not cause gasket to oxidise inwards from the outside edge. Minimum operating temperature is –200°C. 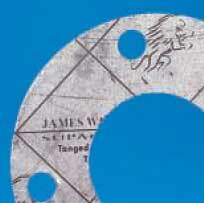 Precision cut gaskets to any shape, size and quantity. In sheets: 1.5m x 1.5m (*1m x 1m if anti-stick). Thicknesses: 1.0mm, 1.5mm, 2.0mm, 3.0mm.